This antibody recognizes a cell surface glycoprotein of 95/115/135 kDa (depending upon the extent of glycosylation), identified as CD43 [Workshop IV]. 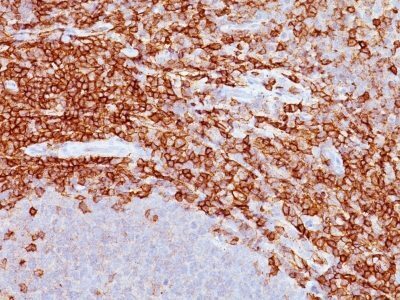 This antibody recognizes a cell surface glycoprotein of 95/115/135 kDa (depending upon the extent of glycosylation), identified as CD43 [Workshop IV]. Epitope of MAb Bra7G is clearly different from that of MAb DF-T1, called b as opposed to a for DF-T1. 70-90% of T-cell lymphomas and from 22-37% of B-cell lymphomas express CD43. No reactivity has been observed with reactive B-cells. So a B-lineage population that co-expresses CD43 is highly likely to be a malignant lymphoma, especially a low-grade lymphoma, rather than a reactive B-cell population. 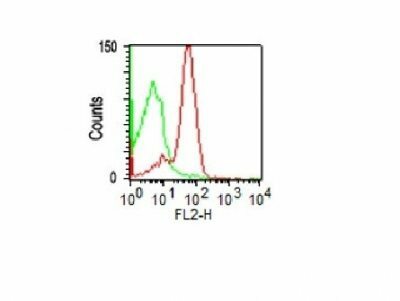 When CD43 antibody is used in combination with anti-CD20, effective immunophenotyping of the lymphomas in formalin-fixed tissues can be obtained. Co-staining of a lymphoid infiltrate with anti-CD20 and anti-CD43 argues against a reactive process and favors a diagnosis of lymphoma. Catalog number key for antibody number 0027, Anti-CD43 (DF-T1) The prefix indicates conjugation, followed by the antibody number and size suffix.